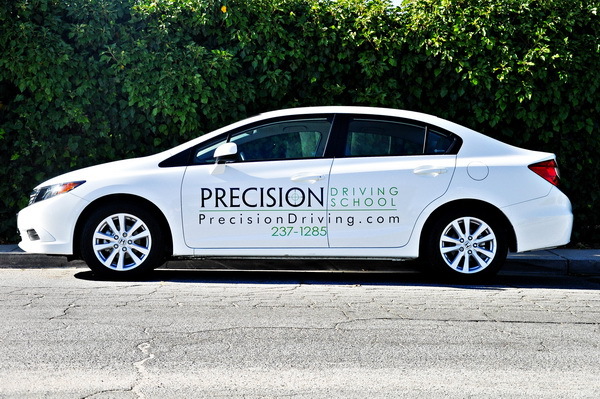 Precision Driving School has provided driver education and behind the wheel driver training for over fourteen years. We are fully insured and bonded and are licensed by the California DMV. Our training vehicle is always clean, well-maintained and safe. We offer a convenient payment plan. Financing is also available. Appointments are available Monday through Saturday. We are also available on most school holidays and breaks. Lessons can start as early as 8:30 A.M. or as late as 7:30 P.M.
We strive to have appointments available within one to three days of your call; especially for first lessons. Individualized one on one lessons are given by our patient and experienced driving instructors. We specialize in training nervous and inexperienced drivers. Each of the four lessons consists of 1 1/2 hours of in car training. The instructor WILL NOT use lesson time for personal errands. The first lesson will cover basic skills of vehicle handling. We WILL NOT drive on the freeway on a student’s first lesson unless parents request it and the instructor feels the student is ready. The final lesson consists of a review of skills covered during previous lessons and it includes a practice driving test. See our FAQ page or contact us with any questions. Please call today to get started. (805) 237-1285.